Who can resist a mashed potato in finger food form? In my experience, mashed potatoes are one of the best parts of any meal. I got the idea for these Mashed Potato Bites because I was in the mood for the double baked potatoes I make but they weren't fitting for the occasion. We were having our weekly movie night at home and I usually make dinner that is good for eating on the floor picnic-style while we watch the movie. Having a mashed potato in bite-sized pieces seemed like a great idea and would be super easy to eat on the floor, so I whipped up this recipe. They were a big hit! 2. Bring large pot of water to boil. 3. Meanwhile, peel and cut potatoes into 1/2" pieces. 4. When water has boiled, add potatoes and bring back to boil. 5. Boil for about 10 minutes or until tender. 6. Drain potatoes and mash with mayo and milk. 7. Add remaining ingredients to potatoes and mix well. 8. Form potato mixture into 1" balls. 9. 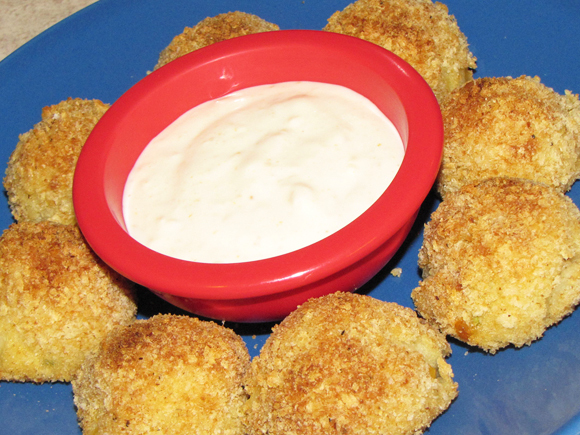 Roll each ball into egg wash and then breadcrumbs. 10. Place on foil-lined baking sheet that has been lightly coated with cooking spray. 11. Bake for 15 - 18 minutes or until breadcrumbs are golden. When I make my double baked potatoes, I make up a little sauce to drizzle on top. It adds a nice flavor and a bit of tang so I thought it would be a nice accompaniment for the little potato bites. 1. Mix all ingredients together and chill for at least 30 minutes. 2. Add the optional milk if the sauce is too thick.